As per the traditional sayings, if we wake up early then we tend to be more productive throughout the day. This saying is supported by various facts stating that most of the successful personalities around the world are early risers. Despite your hard efforts, you are still not able to stop yourself hitting that snooze button again and again, which eventually leads you to waking up late. But you need not worry as I can tell you some secret ways and effective tricks that have always helped me to wake up early. Getting up early in the morning is surely a drag. Though we understand that there are many waking up early benefits, but at the time of waking up we don’t remember any of them. We automatically turn in to a groggy person who is always ready to hit the snooze button on the alarm. To overcome such habits, here are few Tips for Waking Up Early & Conquering the Alarm Clock. Getting out of the bed is like keeping your foot on the fire for many of us. But doing it is necessary, so the best thing you can do is to plan smartly. Take few steps that would help you to wake up early like setting alarms. I hope you have just read the words ‘ALARMS’ . Yes it means, set at least two alarms, one near your bed and another one somewhat at a distance. Note: Make sure that you don’t place it too far . Making up your mind to wake up early, really works. For this you have to try out few ideas to wake your brain up all day long. Listen to podcasts on waking up early. Read about successful people who are early risers. Remind yourself about the importance of writing every day. Don’t wake up with a moody mind set like, why you had to wake up so early. Instead get excited about the day and plan something you like to do. It can be any important work, game, or any fun activity. Ask your friend for help to wake you up early. You should also help him out in waking up. Plan together something, like a have a meeting or even call or text each other when you wake up. A good night sleep will surely help you wake up early, even if you do not have a alarm. Always keep in mind that hitting your snooze button will not give you a undisturbed sleep. Instead you will have to wake up every few minutes just to hit the snooze button. Stick to your wake up time daily. This will help you get habituated to that wake up time no matter what. Keep moving on is the ultimate key for waking up early. May be you will like to relax and sit for a while but that could waste your time and make you a bit drowsy. Set out your exercise clothes. Waking up early is one of the best way to be productive. A good start of your morning will help you look fresh all day long. Let us look at few thing on how to wake up in the morning with energy. Make up you mind and wake up at least 1 minute early each day. By waking up early, you get a lot of time. Use it to complete your small works. Make you of the peer pressure to wake up early. Think about your earlier cases on why you couldn’t wake up early. So, if you want to wake up early then quickly read these ways and start following them right away! Getting a good night sleep is an important thing ensuring that you wake up early the next morning. A good night sleep is possible only when you practice good habits at night before sleeping. Consuming alcohol and caffeine right before few hours of sleep creates a great detrimental effect on the sleep. Even consuming greasy, oily, and fatty foods in the evening can upset your stomach and may intervene in your sleep. Also, those who have a habit of reading on tablet or phone before sleeping are greatly affected by the radiations and can experience headaches and sleep disruptions. Hence, if you want to wake up early then make sure you don’t do anything that can disturb your sleep. If you wake up early morning then you will have lot of time to get your things done. But if you are waking up late then you won’t be able to do things that productively. So, you can plan waking up early morning each day to get things done faster and more efficiently. For this, you can plan doing certain things every morning. Once you are able to achieve small wins, then this will keep you motivated to wake up early morning every day. You must be aware of this logic from your childhood days. But applying them in real life makes all the difference! This is something that actually works. If you seriously want to wake up early morning then sleeping early is the key to go for it. If you sleep 15 minutes earlier than your usual time then you will be able to wake up half hour prior your usual wake up time. So, make sure you sleep early at night so that you don’t feel sleepy or tired in the morning. The environment these days is packed with gadgets and devices all around. If you wish to avail a sound sleep then you must stop watching TV late night. Even putting away mobile phones and other gadgets away is also supportive in timely sleeping. It is because such devices intervene with the disruption of melatonin from the body, which is a hormone responsible for regulating the sleep cycle. Hence, you must avoid sleeping in a noisy room. Also, check a space with soothing sound so that you sleep tight and wake up early in the morning. If you find it difficult to sleep on time at the night then this must be because of your improper napping time. If you will nap after 7 hours of waking up then this will mess up with your sleeping schedule, thereby resulting in late sleeping hours and again waking up late. If you are able to set a schedule for sleeping and waking up on the same time, then even you would not require an alarm clock to wake up on time. Therefore, you must make an effort to follow a schedule for sleeping on time and waking up on time. Plan a schedule for sleeping at least 8 hours in the night. If you are changing the sleeping and waking shifts every other day, then this will never help you to wake up early. As well, it can result in developing some health issues. This is another important thing to keep in check if you want to wake up early every morning. The minimum sleeping hours for any individual is at least 8 hours a day with a half hour nap in the daytime. While some individuals may require less sleeping hours, others would need slightly more than this. So, check for the unique requirement of your body but sleep for at least 8 hours a day. This is again a logical step, according to which if you have set up meetings to be done at early hours, then this will help you wake up early in time for the work. It is because this creates an accountability, which definitely you don’t want to let down. As per biological studies, if we have something important to do, then this will push our mind to wake up early. Remember, when you are waking up early to catch an early train, or when you need to catch up an early meeting. Hence, if you will put something at stake then you fear of your reputation and this is something very important, which will drive you to wake up early. If you are not waking on time, then surely you will be performing some actions that will cause you to fail in achieving your goals. For this reason, it is essential to analyze correctly the things that are coming in between your way to wake up earlier. Check for the steps that you have taken and why did they fail. Also, you must identify how things can be done differently and how you can rectify them to get yourself out of the bed. Be honest with yourself as this will help you to avail appropriate results. Some individuals have a very harsh, loud, and troubling alarm clock, which as per them, is the best way to wake up on time. While there are others who prefer having alarm clocks with a soothing and relaxing sound that would help them to get up in a pleasing mood. There are varieties of alarm clocks available out there. The one fine way to make sure that your alarm clock works for you the best you must look for one that seems appropriate to your waking habits. You can even discuss these alarm clocks with your relatives and neighbors to get the best one for yourself. If you are a heavy sleeper then you will never be able to wake up early in the morning even when you have the best alarm clock for you. For such reasons the best way is to position your alarm clock far off from your bed. You need to position it at a distance that allows listening to the alarm sound but requires you to get off from your bed to switch it off. Also, you can set numerous alarm clocks in the room to develop a habit of waking up early. If you have a roommate, spouse, or your parents living with you then you can always ask their help to wake up early. You can ask them to give you some gentle shrugs to allow you wake up early in the morning. If you are living alone then you can always ask your closed ones to give you a call in the morning, which is also an excellent way to wake up early in the morning. Most of the individuals have a habit of twisting, cuddling, and resting in their bed even when they are awake. If you too have this habit then you must keep a strict check on this. It is because if you rest in your bed for few minutes even when you are awake then this will trigger your sleeping hormones, and there is always a possibility that you may tend to sleep again. If you will sleep again and wait for the alarm clock then you will feel a lot drowsier and sleep throughout the entire day. When you see the bright, shining environment outside then this seems an effective and natural way to wake up faster. Hence, if you wake up anytime in the night then just open the curtains. In the morning, this will allow sun rays to enter your room and will keep you awake. If you live in a cloudy place then you can always use a bedroom lamp as well as bedside dawn simulators that will help you awake early in the morning. When you are trying to wake up early morning, then you must get out of the bed instantly and get your body moving. The best way is to develop an exercise routine as this will have a positive impact on an entire day. Performing such exercises in the early morning will keep your body muscles oxygenated and relaxed throughout the day. Even performing some simple stretching exercises will help you develop an early wake-up mood so that you get relaxed and work all day long. If you feel it difficult to wake up early in the morning then the best way is to take a shower as soon as you get out of the bed. Using shower gels, soaps, and aromatic face washes on your body and face and then applying essential oils on the body gives your body an instant refreshing feeling. Also, if you splash some cold water on your face then this will lower your body temperature and will take off the stress and sleeping feeling away. If it is not possible to take a shower right after you wake up then you may splash some cold water on your face and then apply few drops of essential oils. You must have seen a lot of people having the habit of drinking tea or coffee early morning right after they are awake. It is because tea contains caffeine that stimulates the body to wake up. Besides tea, you can always drink a glass of fresh fruit juice or even simple warm water as this will also help you to awake your senses in just a few minutes. This is a very common habit that most of us practice a lot. But in most of the cases when we think of waking up after 5 minutes we are lest sleeping for 15 minutes or even more. So, rather than thinking of needing few more minutes to awake you can try consoling your mind that you got the chance to sleep early. Waking up early helps you stay all day long relaxed and fresh. Here are few top secrets to waking up early. 9. Don’t Be Afraid to Tweak: Do things that are going to put you in a better “state”. A better state of mind, body and soul. As you would be waking up early you will be having a lot of free extra time, so here are few suggestions to do on extra time. 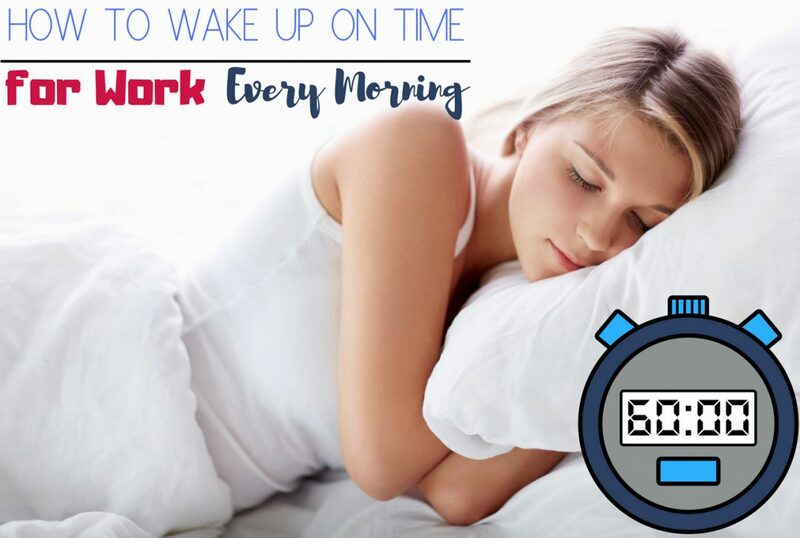 So, follow these amazing tips and practice them on a regular basis to start waking up early on time and be more productive throughout the day, at the same time get more work done in the limited time. Next articleHiring Solutions – How to Recruit Employees Effectively?